Published on 31 August 2008. The penultimate book in this series of reviews pointedly isn’t a polemic by the most irritating of celebrity chefs, but is rather a wonderfully light but deep book combining the words of writer Jamie Oliver and the wonderful photography of Cristian Barnett, breaking taboos surrounding death. This is also the only book in this series which has severely limited availability since the publisher, The Friday Project, went into liquidation earlier this year. TPF was a great publisher that took risks on new authors and new ways of doing things, and so if you’ve read any books published by TFP, then you’ll instantly understand that this is no ordinary book about death. 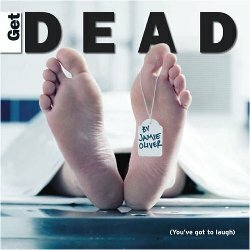 Get Dead deals with the subject from new and unusual angles, in this case through interviews with people with a ‘vested interest’ in death, and presents these alongside quirky facts about the dying process. Did you know, for example, that five times more people commit suicide in the UK than die in Road Traffic Accidents? It’s amusing without ever becoming frothy, dark without ever becoming macabre, occasionally spiritual without being religious, but perhaps most of all enlightening without being educational. Think of it as a documentary version of Six Feet Under, and you’re not far off. I read Get Dead over a couple of days as I got utterly addicted, but its an equally good book to flick through now and again, as it will always come up with something interesting and enlightening. It’s certainly a book I’d be happy to recommend, if you can manage to find a copy. The Friday Project is presently being reborn under the new ownership of publishing behemoth HarperCollins (the first release under their new ownership is the excellent The State of Me, a debut novel by Nasim Marie Jafry about ME), yet whether Get Dead will get a reprint at some point remains to be seen. At the time of writing, there are just over a dozen copies available via sjhoward.co.uk/shop. This book was originally reviewed here on sjhoward.co.uk in December 2006, but the above review is a new original for the ‘Summer Books’ series of reviews published on sjhoward.co.uk and Gazette Live. This 1,368th post was filed under: Summer Books, Books, Christian Barnett, Death, Gazette Columns, Jamie Oliver, Nasim Marie, Publishing, The Friday Project.